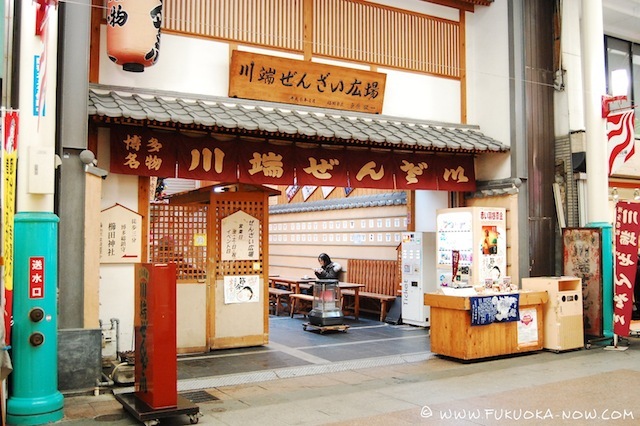 The Kawabata area is centered around Hakata’s oldest shopping arcade, which has been running since the mid-1950s. This 400m long street connects the Hakata-za Theater and Hakata Riverain to the north and Canal City to the south. In recent years, the street is booming with 12,000 visitors every weekday, and 25,000 on weekends. 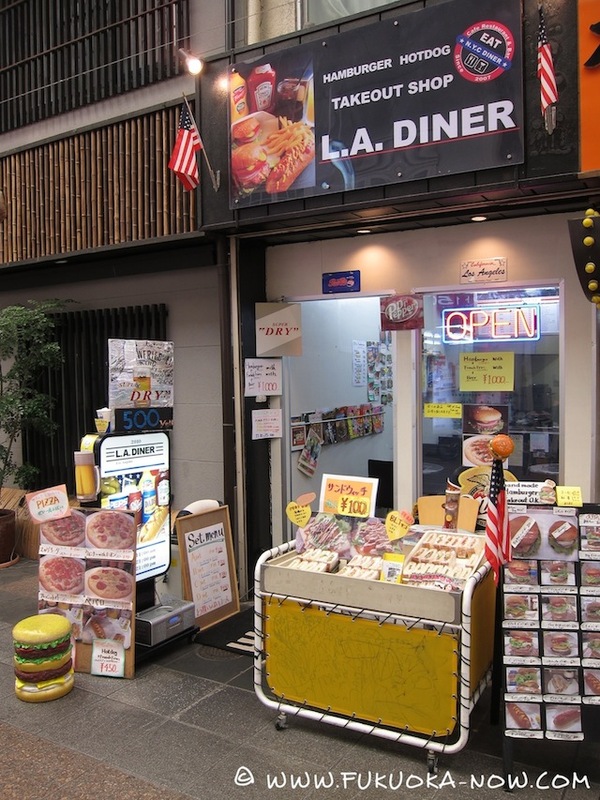 The arcade contains around 125 stores ­­– everything from shops selling Buddhist altars and traditional fabrics to hamburger and noodle restaurants. 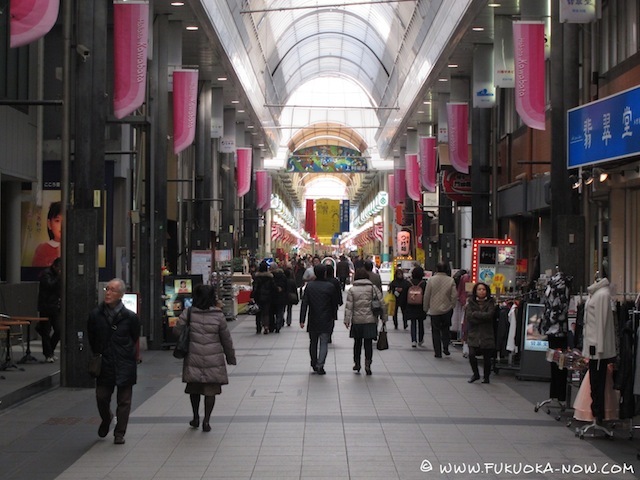 Kawabata shopping arcade (shotengai) is literally the center of this area. A wide variety of shops, both old and new, line the 400m-long street. Head east from the arcade and you will come to Reizen Park. More than just a nice place for a stroll, it is also a popular spot for cherry blossom viewing in late March/early April. Fukuoka Oktoberfest is held here every October too, and the park is also used as a meeting place during the Hakata Dontaku and Yamakasa festivals. 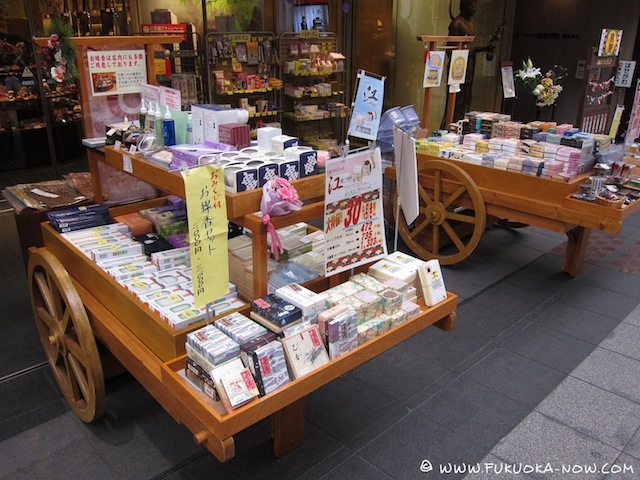 At Kawabata shopping arcade, you can find many unique and kitsch items that make good souvenirs. The mask in this photo is called Niwaka-men and is unique to Hakata. Another notable landmark is the 50-year-old Reizensou building that stands in a back alley between Reizen Park and the shopping arcade. From the outside it may appear to be just another boring concrete building, but step inside and you’ll find an array of hidden delights including a photo studio, a bagel shop, a Korean restaurant and Japanese food stalls. To the south of Reizen Park is Kushida Shrine, affectionately nicknamed “Okushida-san”. Festival floats are displayed in the grounds all year round, as is a famous “lifting stone” with which legendary sumo champions such as Futabayama and Asashoryu have tested their strength. You can actually have a go at lifting one of their other lifting stones, so any aspiring sumo wrestlers can put their muscle where their mouth is! 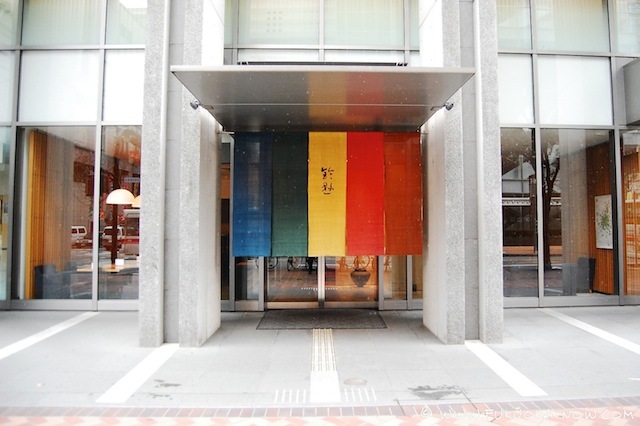 Kawabata shopping arcade’s slogan is “a street where you can discover the spirit of Hakata” and it really is an area where you can feel in touch with local culture, both old and new. The delicate Japanese sweets sold at this 90-year old store are a feast for your eyes as well as your stomach. Their rice cakes filled with azuki beans are particularly popular. On-site café too. 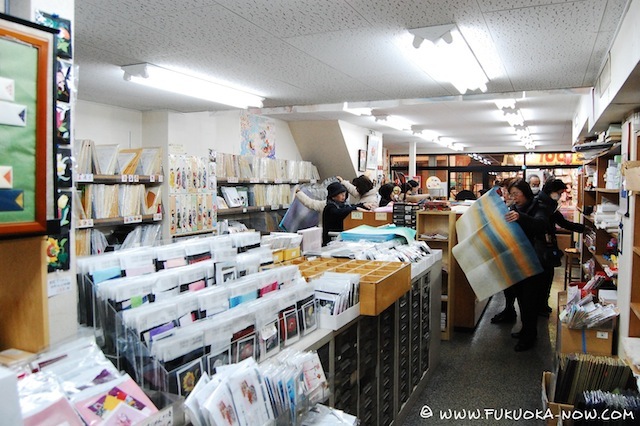 Long-established Japanese paper shop, with the kind of wide selection befitting a specialist store. 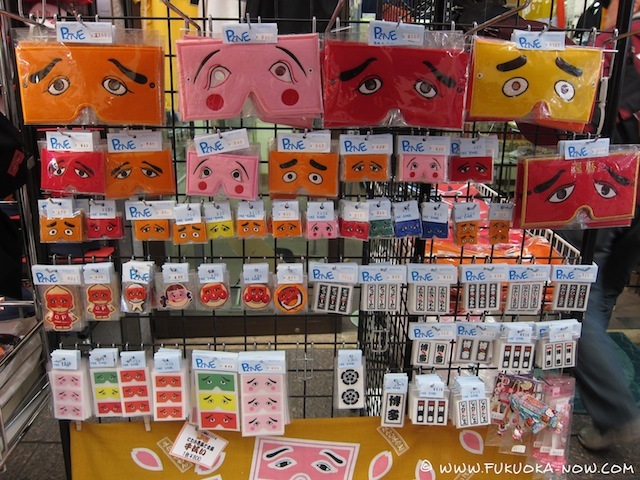 Their beautifully patterned yuuzen printed paper (¥300 ~ 1,000) looks great as a wall hanging. For all your Buddhist desires (if that isn’t an oxymoron). The 3rd floor features free exhibitions of rare works and, even more eye-catchingly, a tea room covered with 10,000 sheets of platinum leaf! 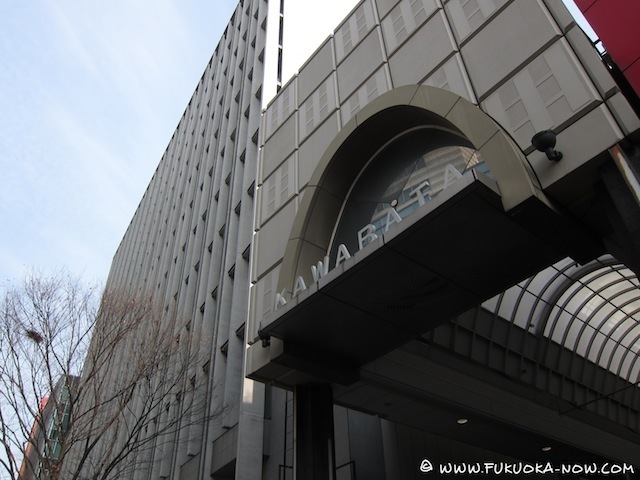 The entrance of Kawabata shopping arcade faces Meiji-dori, where other tourist attractions like Hakata-za Theater are located. 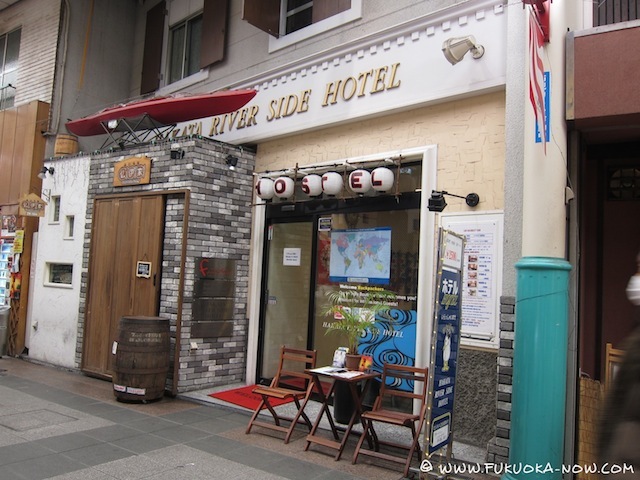 Hakata River Side Hotel is an inexpensive but good hotel that is popular among backpackers from overseas. 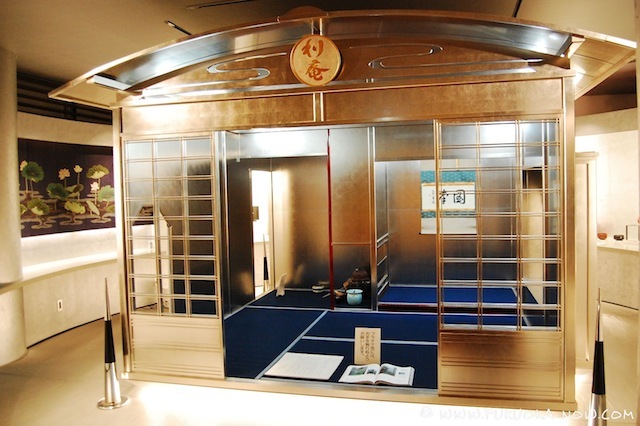 Obutstudan no Hasegawa sells various items used at Buddhist ceremonies. 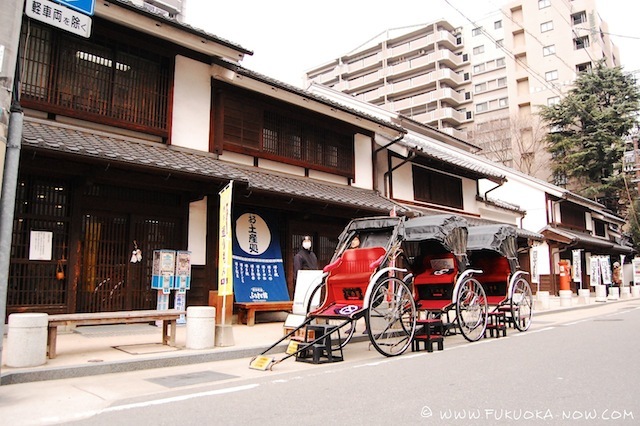 This gun shop, Hakata Jyuho-ten was established in 1628. Various hunting guns are available. Kawabata Zenzai Sweet red bean soup (zenzai) served under a Yamakasa float and riverside view. A must! 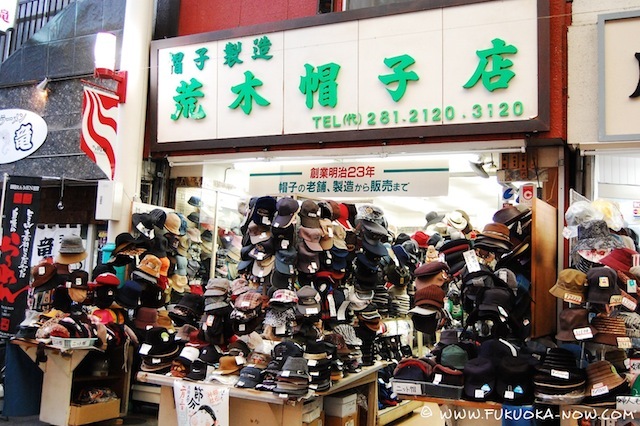 Araki Hat Shop More hats than you can shake a stick at!